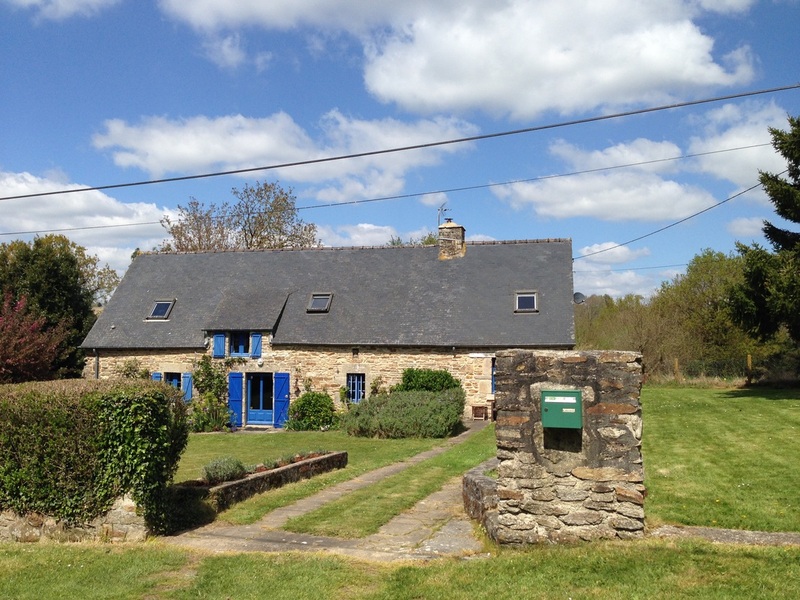 Our south facing longère is located in a quiet and peaceful hamlet called La Ville au Tady, near the village of Guegon. The hamlet consists of just four houses and is accessed via a five minute drive down scenic country lanes from the Village. The road becomes a track a short distance past our cottage, but you can continue on to loop back to the tarmac road. This track passes the old mill house, le Moulin de Panros, which is situated on the bank of the River Sedon (the owner of the Mill House is the local taxi/ambulance driver). The property stands in over 1 acre of gardens, which are enclosed by a fence at the rear and hedged at the front, offering a good level of privacy. The front and rear borders of the cottage are planted with a variety of climbing roses, shrubs, herbs, lavender and hydrangea. The rear boundaries are dotted with oak, chestnut and crab apple trees. 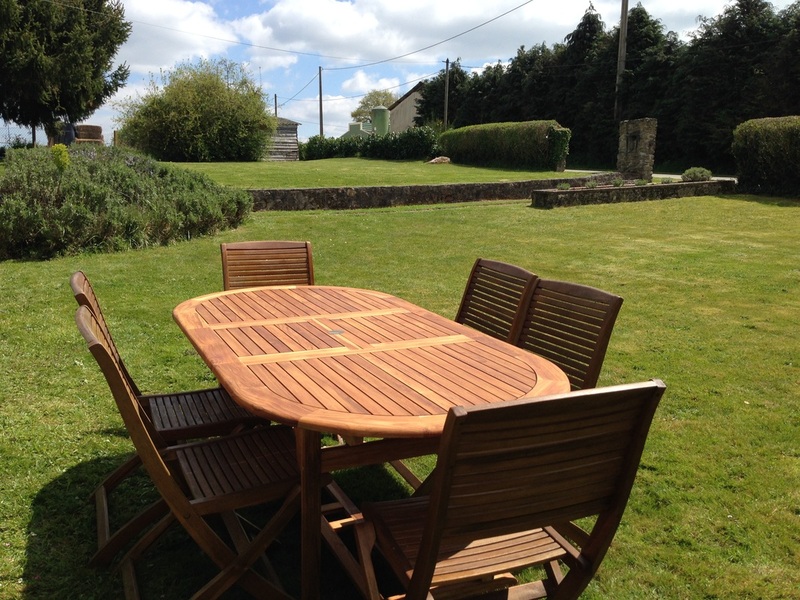 A hardwood table and six chairs are provided for outdoor eating in the front garden where dappled shade is provided on sunny days by our neighbour's Hawthorn tree. This is a lovely spot for lunch on a sunny day, and even evening meals in high summer. 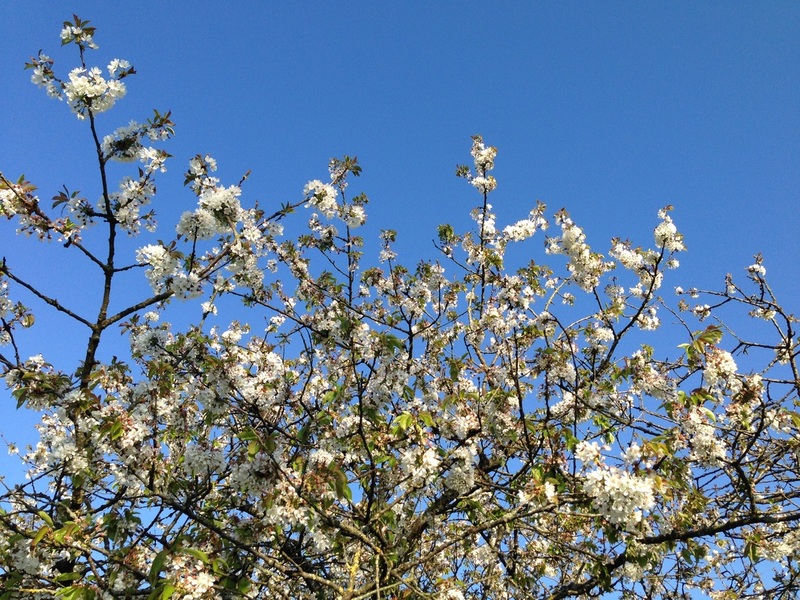 In the rear garden there is a small orchard of mixed fruit trees including cherry, apple and plum. There is a very large old walnut tree, sweet chestnut and hazel nut trees. These trees can provide welcome shade from the sun in the mid-summer months, and is our favourite spot for our hammock. If holidaying in the autumn, you are welcome to help yourselves to any fruit or nuts (although you need to get there before the red squirrels!). In October/November you can collect chestnuts from the garden and roast them on the open fire. This will help compensate for the cooler weather, although you do get sunny days. There are only a couple of close neighbours in the hamlet. The nearest neighbour is situated to the left of the cottage, about 15 metres away, but does not directly overlook our cottage. Many years ago these two cottages were part of the same building joined together by another building in the middle, which no longer exists, but you can still see the remains of the old fireplace on our gable end wall. 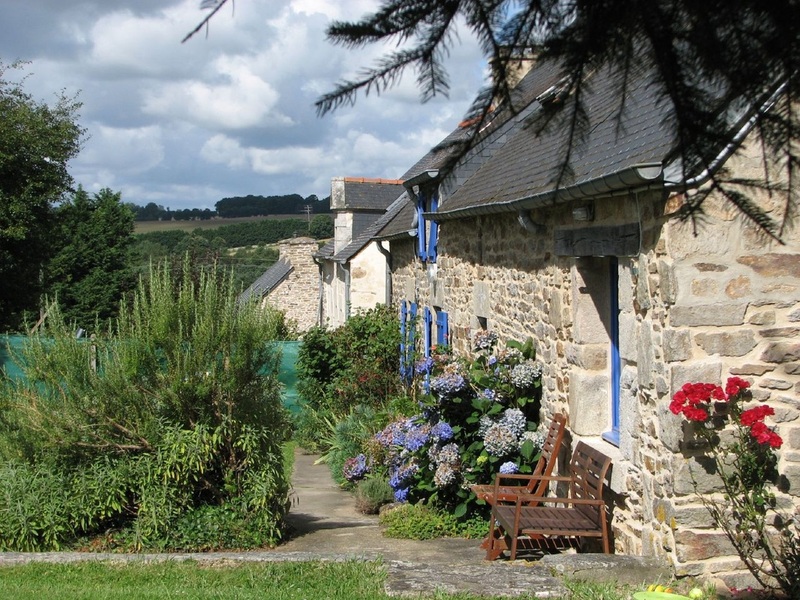 The next door neighbour's house is occupied by Vince and Sylvie who are sculptors and stonemasons who frequently work away. Next door-but-one is Marthe, a retired Breton lady who assists us in keeping an eye on the cottage (she speaks more Breton than French) together with her adult son and daughter. A little further down the lane are a French family who recently moved into the hamlet to renovate an old farmhouse. The Longère is surrounded by farm fields to the front, right and rear. The fields are used to grow crops and Patrice the local farmer rotates between grass, wheat and sweetcorn in alternate years. He also farms pigs and turkeys (indoors). 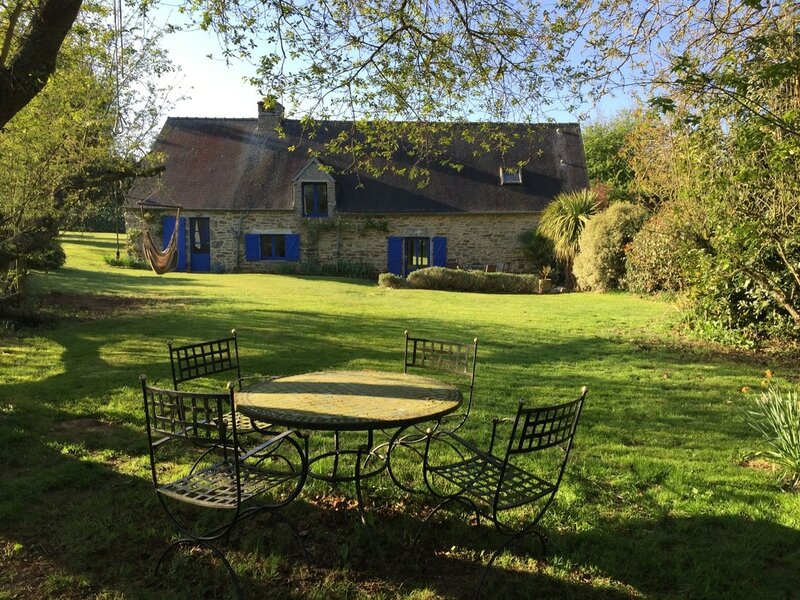 The rear of the longère provides pleasant views over the garden, and is a peaceful place to sit and relax, read a book, enjoy a barbecue or an al-fresco lunch. We provide a hammock to string between the trees, and a couple of sun loungers. A gravel terrace at the rear is ideal for barbeques and meals, and is shaded by the cottage wall during the height of hot summer days. A hardwood table and chairs for six, with parasol, are provided. The rest of the garden is bathed in sunshine. A wrought iron dining set sits under the shade of the fruit trees, and is a great spot for afternoon tea, or lunch on a hot day. 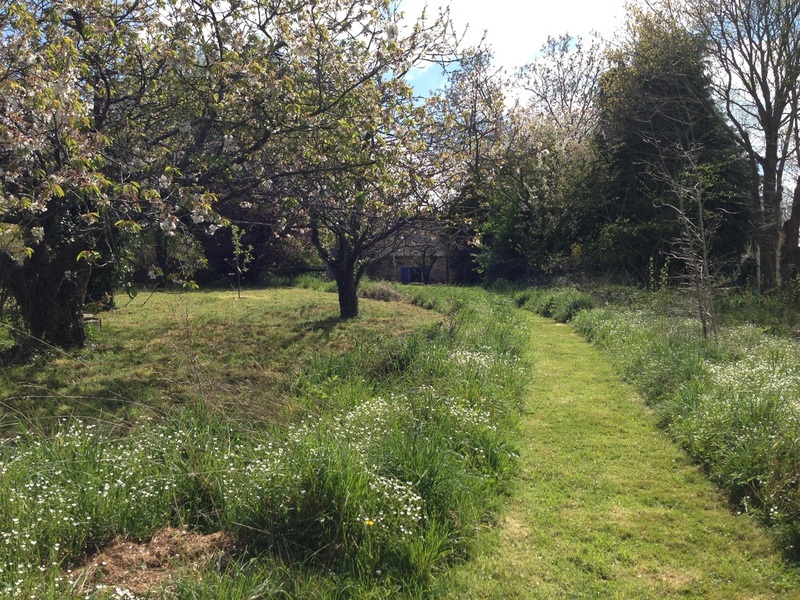 A mown path cut through the grass ambles around the lower garden and leads to a granite bench. This is a great place to sit and enjoy the splendid peace & quiet and watch Buzzards soaring high above the surrounding woods and fields. Children can safely be left to play & explore the limits of the rear garden which is fully fenced. The garden extends for quite some distance, sloping gently downwards towards the River Sedon which is about 200 metres beyond our rear boundary. The river is popular with locals for fishing - look out for the otters which you can sometimes spot from the bridge next to the old mill house. A bank of ancient Sweet Chestnut trees, hundreds of years old, form the rear boundary of our garden. Due to the mild climate, the grass growing season is longer than in the UK. From March to November our caretakers will visit as required to cut the front, side and rear lawns. The garden is very large, and it is not feasible to cut all the grass, so the garden is not mown beyond the fruit trees, except for a loop of paths through the long grass. The far end of the garden, naturalised with grass, blackberries, oak trees, and bracken, is left for the benefit of local wildlife. 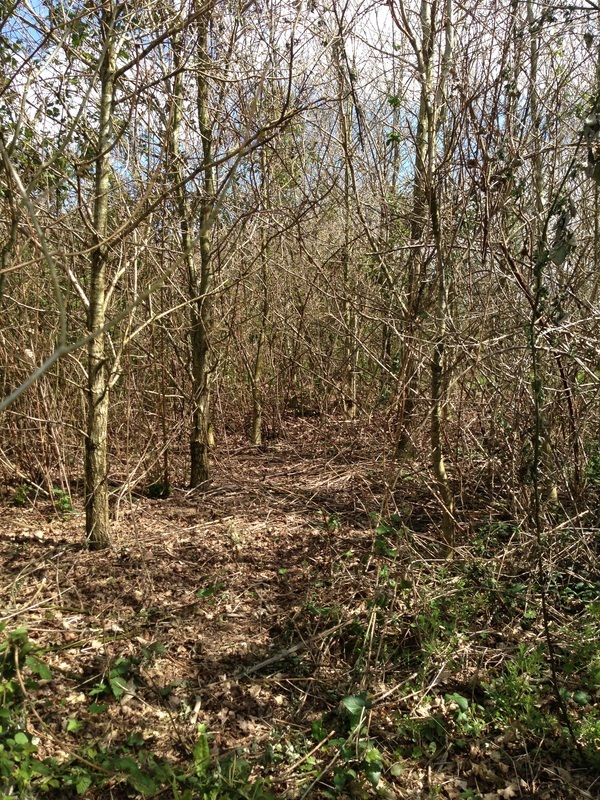 We intend to let this area naturalise into a small oak woodland. It also makes for a great run-around area for children to play hide & seek and explore. There are so many areas to sit and relax in the garden, you'll be sure to find something to suit.